MOSCOW (AP) — Olympic champions Alina Zagitova and Yuzuru Hanyu built commanding leads in the short program at the Russian round of the figure skating Grand Prix series on Friday, and neither was especially happy with their skate. 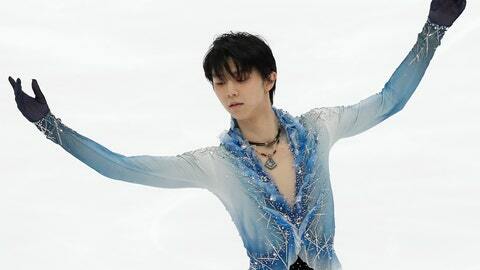 “I can’t say perfect,” was the verdict of Hanyu, who earned a 20-point lead over the men’s field. Zagitova said she was only “a bit pleased” with three flawless triple jumps and a lead of 13 points. Both are aiming for their second Grand Prix gold medal of the season. Zagitova scored 80.58 points, while another young skater from Russia’s seemingly endless production line, Sofia Samodurova, sits second on 67.40. Zagitova has only once failed to win an individual skating event since moving up to the senior level last year. Far ahead of the men’s field, Hanyu landed a clean quadruple salchow and quad toeloop-triple toeloop combination for 110.53 points. As usual, his fans hurled dozens of Winnie the Pooh toys onto the ice in celebration. Hanyu is looking to win both of his Grand Prix events in a single season, not including the finals, for the first time. The Japanese skater said he struggled with a two-week turnaround from winning his last competition in Helsinki, and trained with less intensity to compensate. “It was a little strange and it was a little hard to control, but I can say I’m good, whatever, for the short program today,” he said. Coach Brian Orser said Hanyu took time to get fired up. Morisi Kvitelashvili of Georgia recorded his best Grand Prix short program placing of second with 89.94 points. Experienced Swedish skater Alexander Majorov was third with 82.33, putting him in reach of a first Grand Prix medal in a decade-long senior career. Potential rivals for Hanyu faltered, including Keegan Messing of Canada in seventh and Mikhail Kolyada of Russia, last season’s bronze medalist at the world championships, in eighth after an error-strewn skate. Russia could win three gold medals on Saturday. Besides Zagitova, Russia skaters lead the pairs and ice dance. Evgenia Tarasova and Vladimir Morozov were on track to retain their pairs gold from last year’s Rostelecom Cup after leading the short program with 78.47. Italians Nicole Della Monica and Matteo Guarise are second on 72.32, with Daria Pavliuchenko and Denis Khodykin third on 69.38. Alexandra Stepanova and Ivan Bukin lead the ice dance on 74.49 after the rhythm dance, with Christina Carreira and Anthony Ponomarenko second for the United States on 69.01 as they aim for a first medal in only their second Grand Prix appearance. Spain’s Sara Hurtado and Kirill Khaliavin were third on 66.40.